When sponsors, vendors and exhibitors attend events, they have one specific intention: to generate leads. As a meeting planner, your goal is to add value to your event and facilitate lead capture as much as possible. The key is to optimize what’s most valuable to exhibitors and sponsors: lead data. Successful meeting planners help exhibitors and sponsors make the most of their investment through lead retrieval systems and specialized reporting. A lead retrieval app is the best way to make it all happen. All event attendees (vendors, exhibitors, sponsors, planners and attendees alike) have one thing in common: a smartphone. Lead retrieval systems take advantage of any smart device with a QR code scanner and reader, enabling sponsors to more efficiently manage and maximize onsite lead capture. Once a direct connection is made with the in-app QR code, exhibitors and sponsors can add notes, favorite connections and integrate lead data with the rest of their event app data. Lead scanner apps also facilitate two-way networking: exhibitors and sponsors get their own QR code (per company) and as participants visit their booth, the participants scan the QR code of the company to form a “sponsor connection.” Reporting then shows who connected with the sponsor and when. Another option is through use of RFID technology — a small chip embedded in the attendee badge. With RFID lead retrieval, exhibitors and sponsors use an RFID reader connected to their phone or tablet to tap the badge (instead of the QR code scanner). The main difference between QR and RFID is the extra hardware. The RFID reader, typically about the size of a flash drive, plugs in to your phone or tablet via an extender cord. Why use lead retrieval apps? Apps can be used for in a variety of settings, including events and tradeshows. While all event types (meetings, conventions, conferences and trade shows) all have exhibitors and sponsors, trade shows give companies in specific industries the opportunity to showcase their products and services. Whereas most conferences are open to the public, trade shows often require a screening process for attendees. Attendee-sponsor connections are important for all events, especially trade shows. When leads are so important, the alternative to a trade show lead app — costly, bulky and time consuming equipment and printed lead lists — just doesn’t cut it. With MeetingPlay’s app as an example, let’s walk through some of the benefits. Lead retrieval apps work from any phone or tablet, so exhibitor booth staff don’t have to wait for access to a lead capturing tool. Similarly, if an exhibitor walks around the exhibition floor and interacts with a potential lead, there is no need to exchange business cards or write down information — they can just pull out their phone. Exhibitors and vendors can instantly add notes to any lead they’ve captured, and customize any information received, including name, company, title, and more. With the MeetingPlay app, you can also rate each lead with the app’s five-star rating system. Leads collected from an app are stored in a cloud system that can be accessed both onsite and offsite, at any time. There’s no need for exhibitors and vendors to wait until after the event or conference to measure ROI. No waiting for event planners to provide the reports either: reporting and metrics can also be viewed in real-time, 24/7. 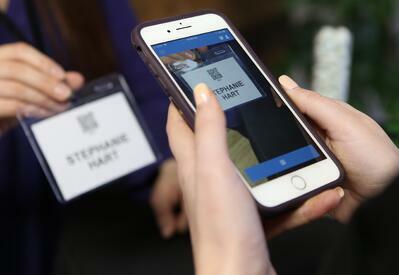 With beacon technology, there are new possibilities for attendee-exhibitor interactions. Exhibitors and vendors can gather leads nearby using their app, without ever needing to scan an attendee’s badge. MeetingPlay reports on attendees who visited an exhibitor booth, even if there was no real-time connection made. For example, if an attendee visits a booth but it’s busy and they don’t get a chance to connect with the sponsor, that sponsor will receive a report that shows the dwell time and contact details so they can follow up. If you incorporate gamification (common with MeetingPlay event apps), you can create more sponsor connections. 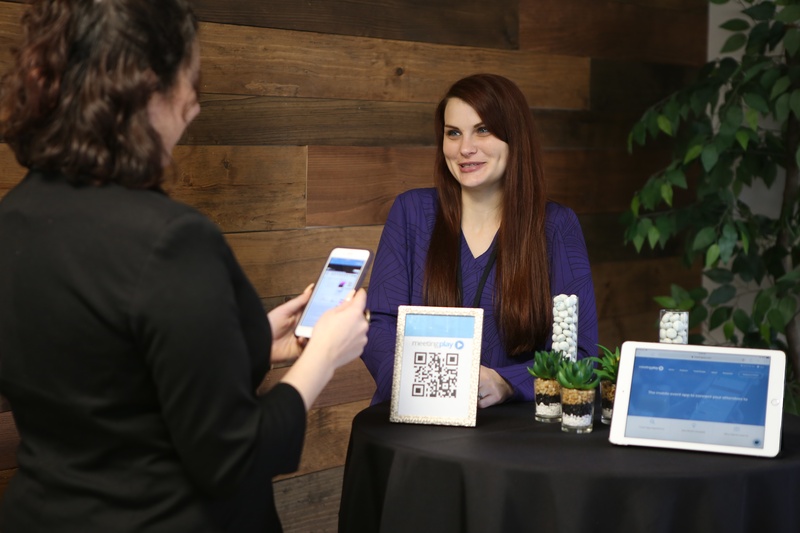 For example, attendees can earn additional points when they interact with vendors, correctly answer quiz questions, or scan a sponsor’s QR codes. Participants can access a list of the different sponsors they need to visit, and all interactions are captured via a QR scan or beacon connection. For events, conferences and especially trade shows, MeetingPlay’s event lead capture app is a must have. It enables exhibitors to immediately access leads, and integrates with all of your event app’s features and data, including session and attendee tracking. Learn more about MeetingPlay’s lead retrieval app (and why your exhibitors will love it) with a free demo!